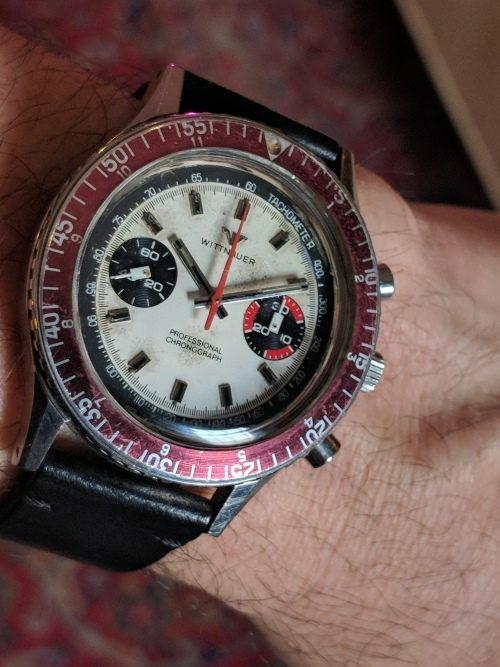 Home / Shop – Vintage Watches For Sale Used & Antique / Uncategorized / Wittnauer Professional Chronograph 40mm. These WITTNAUER PROFESSIONAL chronographs are VERY highly sought after. This is the LARGE cased (40mm.) version which is the MOST difficult to find. Further, this is the rarer, reverse panda (original) dial with baton original handset displaying attractive patina. This watch looks MUCH better in person. The large steel case has NEVER been polished-all original. The Valjoux 7733 manual winding movement was recently cleaned with all chronograph functions operating properly. The turning bezel has turned to a slightly lighter shade, adding more interest. This WITTNAUER CHRONOGRAPH is awesome! We priced this watch EXTREMELY well.